When NASA's Curiosity rover attempts to land on Mars next month, it will join a long list of missions that have sought to touch the Red Planet, a legacy that dates back more than 40 years. The $2.5 billion rover, also known as the Mars Science Laboratory, is slated to attempt an unprecedented landing procedure on Mars on the night of Aug. 5. Curiosity is too large to use airbags to cushion its landing. Instead, the rover – which, at approximately 1 ton, will weigh about 760 pounds (345 kilograms) in Martian gravity – will descend to the Martian surface using a complex rocket-powered sky crane system, which relies on precise mechanics and timing. Once on Mars, Curiosity will look for signs that the planet was ever hospitable to life. And while the anticipation of the landing may be nerve-racking, Curiosity is by no means the first spacecraft to attempt the tricky business of setting itself down on the Red Planet. 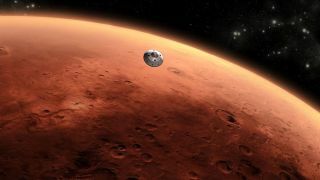 The first country to attempt to land a spacecraft on Mars was the Soviet Union, which in 1971 launched the Mars 2 lander on May 19, followed nine days later by the launch of Mars 3, its identical sister spacecraft. Mars 2 survived the long journey to Mars, an impressive feat in itself, but when it arrived on Nov. 2, the probe largely burned up from the steep entry and crashed to the surface. Mars 3 arrived at the Red Planet on Dec. 3. This time, the descent into the Martian uplands of Terra Sirenium was successful, making Mars 3 the first spacecraft to make a soft landing on Mars. Yet after this groundbreaking accomplishment, the probe operated on the surface for only about 20 seconds before it inexplicably fell silent, transmitting no more signals back to Earth. The Mars 7 probe, which was launched on Aug. 8, 1973, included a flyby module and a lander. This mission proved to be another failure: The lander missed the planet entirely. Next came NASA's Viking 1 spacecraft and, with it, success. Viking 1 launched Aug. 20, 1975, on a mission to study the surface of Mars. On July 20, 1976, it became the first spacecraft to land on the Red Planet in condition to follow through on its mission. The 1,270-pound (576-kilogram) lander was dropped from an orbiter and made a three-point landing using a parachute and rocket engine. Viking 1 was equipped with three biology experiments, and it spent six years analyzing the Martian soil for evidence of life on the planet. The probe operated until 1982 without finding clear evidence of microbes on Mars. The twin Viking 2 lander, which was launched on Sept. 9, 1975, made the second successful Mars landing. Viking 2 touched down Sept. 3, 1976, on the flat plains of Utopia Planitia, where it scoured the planet's surface. Like Viking 1, it found no clear evidence of microbial life, and it was shut down in 1980. Still, the two Viking orbiters and landers combined to beam back more than 50,000 photos of the Red Planet. The Soviets launched two spacecraft once again in 1988, to orbit Mars and land on the Martian moon Phobos. Both the Phobos 1 and 2 missions proved to be failures. The Phobos 1 spacecraft was lost en route to Mars, and the Phobos 2 lander was lost in 1989 near its target destination. On Nov. 16, 1996, with the Soviet Union dissolved into separate republics, Russia launched the Mars 96 spacecraft, which consisted of an orbiter, two landers and two penetrators. A rocket failure resulted in the loss of the entire mission shortly after liftoff. The following month, NASA embarked on the Mars Pathfinder mission. The Mars Pathfinder Lander touched down on the Red Planet on July 4, 1997, and released a small, six-wheeled rover, called Sojourner, to study nearby terrain. The mission was designed for only a few weeks but ultimately lasted almost three months. The spacecraft made its last communication with ground teams on Sept. 27. After a string of successes at Mars, NASA suffered a failure in 1999, when the Mars Polar Lander crashed just before landing due to an engineering flaw. The European Space Agency experienced a similarly disappointing loss four years later. The British-built Beagle 2 lander plunged through the Martian atmosphere on Christmas Day in 2003 and was lost on arrival. An investigation later determined that a lower-than-expected atmospheric density may have caused the probe's parachute and airbags to release too late. Ground controllers lost communication with Spirit in March 2010 and were unable to revive contact with the rover despite multiple attempts. NASA officially declared Spirit dead in May 2011. Opportunity, however, is still alive and well on Mars. The rover has currently logged more than 20 miles on the Red Planet and is now investigating the massive Endeavour crater. NASA's Phoenix Mars Lander was launched on Aug. 4, 2007, and arrived at the Red Planet on May 25, 2008. Phoenix confirmed the presence of water ice beneath the planet's surface after digging through Martian soil. Unfortunately for the mission, the spacecraft's solar panels were damaged during the unforgiving Martian winter, and contact with the lander was lost in November 2008. Phoenix was officially declared dead in May 2010. The Russian Phobos-Grunt mission was well-publicized, but for all the wrong reasons. The probe was launched on Nov. 8, 2011, on an ambitious mission to return samples from the Mars moon Phobos. Shortly after launch, however, the spacecraft malfunctioned, leaving it stranded in Earth orbit. A later investigation determined that an engineering glitch prevented Phobos-Grunt's thrusters from firing in a maneuver that would have sent it journeying out to Mars. After languishing in the wrong orbit for roughly two months, the spacecraft plummeted back to Earth and was destroyed during the re-entry on Jan 15, 2012.